Digimon: System Restore: Fusion Episode 01: Mikey Goes To Another World! Normally it's hard to judge a show by its first episode. There are always so many introductions, so much exposition that it's hard to tell what's important, and that fleeting glimpse of the protagonist's idea of normality that gets dashed before the first commercial break. Except for the cluttered openers in the first two seasons, all of the pilot episodes in Digimon have been very good and this one is no exception. Unlike Tamers, Frontier and Data Squad, however, Fusion puts everything it has to offer on full display. One episode in, you'll have a pretty damn good idea whether you'll like this show or not. For starters, no other pilot puts the main objective front and center the way Fusion does. Adventure and Tamers were happy just introducing the kids to their Digimon. The other three were vague about the kind of threats they'd be facing. With Fusion, you know what we're going to do tonight? Try to take over the world! Shoutmon wants to be the king, and judging by the massive army in the opening dream sequence, there's a lot standing in his way. Between the challenge MadLeomon brings with his own army and mysterious onlookers Nene and Christopher, we know what he'll have to deal with. The amount of personality we're getting out of Shoutmon this early is a sign of how good the Digimon characters are in this series. Once the kids arrive in the Digital World, and even a little before that, Shoutmon's desire to become king overwhelms everybody. It's at the point where, for the first time, you're not sure whether the gogglehead or his Digimon is truly the main character. 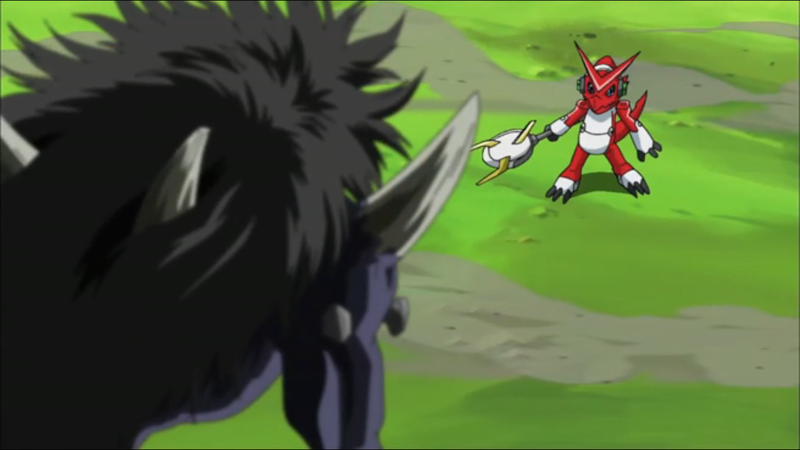 Even the likes of Guilmon or Data Squad Agumon took a backseat to their partner most of the time. 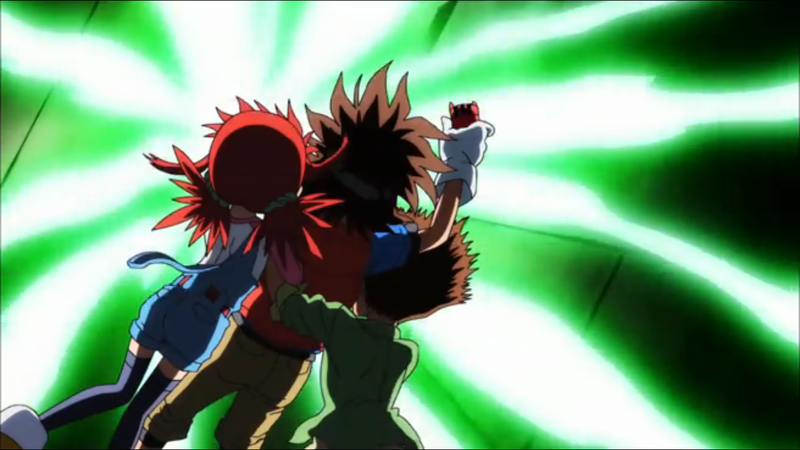 Until Mikey figures out the whole digifuse thing, he sort of just stands in awe while Shoutmon does his thing. In this case, even his digifuse thing feels like mere support. So yeah... the digifuse thing. Once you get past the way it disregards a decade's worth of standard Digimon evolution protocol, it adds a lot of potential. Having both the Shoutmon+Ballistamon and Starmon+Pickmon fusions illustrates how we'll get various combinations that deviate from the linear chain that we're used to. It's a drastic change, but it shouldn't discourage anybody. It basically combines Zero Two's DNA Evolution and Zero Two's Armor Evolution's potential for multiple forms. While this first episode still has the introductions, exposition, and a fleeting glimpse of the protagonist's idea of normality, it's an awfully useful glimpse that helps frame the unusual nature of our human hero and his two companions. 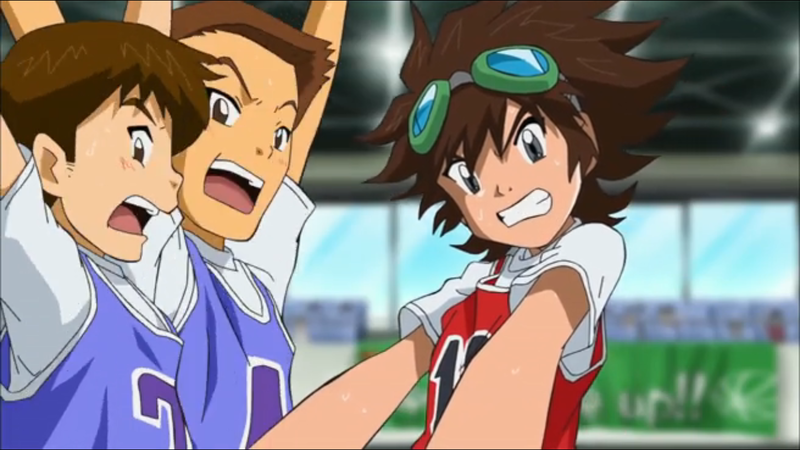 While Tai and Takuya were presented as fairly average kids and Davis and Takato were even portrayed as being a bit dimwitted, Mikey has a pretty good handle on things and knows what it takes to excel. He's not as naïve as previous goggleheads (including Marcus), altruistic to a fault and favors intelligence over glory. Pretty good information to get out of a game of basketball. Jeremy and Angie accidentally end up going along for the ride, and that alone is an interesting twist. One is a competitive nut, gamer geek and self-proclaimed rival. The other is an overly concerned childhood friend. Plenty of character and potential with these two, which seriously conflicts with the fact that they're about as useful as Kazu and Kenta where when they first jumped in. While Mikey and Shoutmon dominate the attention, these two are important for entertainment value even when they contribute little to the actual effort. It's a scary challenge, considering the last time they tried that they ended up with Bokomon and Neemon. Despite them not having partners, what's oddly reassuring about Jeremy and Angie is the fact that they're completely insane. When confronted with them in the same mode as they are when they're screaming at Mikey, you feel the urge to back away slowly. That's really useful in a situation where they'll have to stand on their own merits. How insane is Angie? She makes movie plans months in advance and stalks Mikey when something else comes up. Then again, Mikey practicing basketball for hours before his game isn't healthy either. Where the Digital World last season had all sorts of oddities to remind you of its nature, the main feature of this season's world is the assorted floating islands, hopefully representing the various zones. I should probably watch the dub at some point. Aside from an early trailer that I loathed (and am not entirely sure was even the same dub? I heard that there was supposed to be two versions or something), the voice acting seems as good as ever. It helps that Shoutmon's VA seems to be trying his hardest to get the show advertised. And points out details the localisers seem to miss. I noticed a few things that I think should be mentioned. Is ANYONE else concerned what Mikey's mom is cooking in that pot? Second, why does Angie's bag still say 'Taiki' when it should say 'Mikey'? Mikey is noticeably similar to Tai, is he not? Also, this "Kevin" person, he reminds me of the 02 version of T.K, and if I'm not mistaken, he even has the same voice actor. The contents of that pot were THIS close to getting a bullet point! But given my knowledge of cooking technique, for all I know that was a totally legitimate way to flavor broth. One episode and she's already up there with Tai's mom for worst cook. And Angie's bag remaining Taiki isn't the first time they've missed changing physical objects to dub names: Izzy had a name plate on his door reading Koshiro. Re: the name plate, that's actually not a miss at all - the original plate read "Kōshirō" (with macrons), while the dub edited it to read "Koushiro". "Koushiro" matches what was labeled as Izzy's "real" name in the first dub episode of Adventure (despite the fact they never use his "real" name ever again, not even his parents), so I suppose someone on the dub team figured at least someone would remember it.